When Krishna Venkatesh, a musician who wrote the score for the yoga documentary movie ‘Enlighten Up’, suffered a serious back injury in 2008, he began a yoga practice, searching for relief. He explored Iyengar and Ashtanga practices, and eventually found the Stone Center for Yoga and Health in Teaneck, New Jersey, outside New York City. He immersed himself in the study of Stone Yoga, an adaptive, therapeutic approach accredited by the Yoga Alliance, in time resolving his back pain. He returned to the music world, recently producing a groove re-mix chant CD with David “Durga Das” Newman, but in the meantime began teacher training at Stone Yoga. After completing his studies, the newly registered yoga teacher began working, with a focus on precise, but case-sensitive alignment. “I was born in Philadelphia, but my father was Swiss. We moved to Switzerland when I was ten-years-old. A weight lifter and swimmer, she was undeterred. “I’ll be damned if I fail at yoga,” she recalls thinking. teachers near the university in Zurich and began attending classes. Sivananda Yoga is a traditional system concentrating not only on exercise, but breathing, relaxation, meditation, and diet, as well. “They kept saying, close your eyes, focus on your breath, and I kept saying, when are we going to get to the good stuff, moving, sun salutations. I always skipped savasana because I thought it was a total waste of my 10 minutes. Nothing takes the place of persistence. After a year she was able to touch her toes. She continued her efforts and eventually entered into an informal apprenticeship. But, they warned her against ever teaching yoga to others. But, within a year, with their blessing, she was teaching an occasional Sunday morning class. “I really fell in love with it,” she says. After returning to the United States in 1977, enrolling at the City University of New York to pursue her master’s degree, and meeting her future husband, she taught power-style vinyasa yoga part-time at gyms. She also taught at a small ballet school near Lincoln Center. “The school was run by a Russian lady and one day she looked in on what the girls and I were doing. It did not go well,” Charlotte Stone remembers. “I regarded that as my exit cue,” she says. She continued to regularly practice yoga, her own Ashtanga-based practice deepening, and continued to teach part-time. She began to share her newly adaptive style of yoga with others. “I found, if I can’t write full-time, yoga is the only other thing I know how to do, so I did that. Whenever I brought it up, it always fascinated everyone. They would ask, what do you like about it, what can it do for me? “The yoga began to take off, and I finally decided to put my money where my mouth was and get formally trained.” She enrolled with Phoenix Rising Yoga Therapy, a Vermont-based training program that combines old-school yogic wisdom with contemporary dialogue techniques with the aim of guiding practitioners to their edge of deep physical sensation, inviting insights about their lives off the mat. “It was an eye-opener,” she says. In 1991 she opened a small studio in Teaneck. “All my friends said they were tired of moving furniture around in our family room for classes. I thought I’m going to give it a shot.” Within five years she had trained as a Structural Yoga teacher, then as a Structural Yoga therapist, and moved the studio to larger quarters. She increasingly worked with people suffering chronic pain and illness. “It’s based on anatomy and physiology, with a grounding in Ayurveda, and goes far beyond saying do yoga three times a week and call me in the morning,” says Charlotte Stone. “It’s being present for the person and inviting a change to occur. The art of teaching is the art of awakening the mind and spirit, both student and teacher. “I used to think yoga was a great sport. Over time I came to understand it is much more. In the Yoga Sutras it says yoga should be ‘steady and comfortable’. If you look at some of our yoga today, it doesn’t look steady, and it certainly doesn’t look comfortable. It almost makes me want to send letters of apology to my early students,” she says. 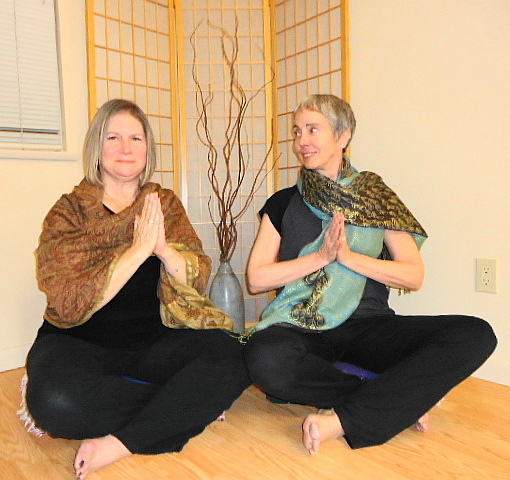 A member of the International Association of Yoga Therapists, Charlotte Stone blends her experience of Structural Yoga with the adaptive approach of Viniyoga, the principles of Ayurvedic balance, and the organic movements of Feldenkrais, which is a method of communicating with the unconscious through movement. Stone Yoga’s emphasis is on alleviating pain, reducing stress, and enhancing well-being at every level. Out of past beginnings had come a new beginning.